This page, dealing with what was eventually published as Sinningia ramboi, is retained for historical reasons. To view the current page for this species, click here. Seed obtained from the AGGS (now Gesneriad Society) Seed Fund under the name S. sp. "Waechter" yielded two different kinds of plant. The first matched what Alain Chautems had applied the holding name sp. "Waechter" to, and is now believed to be Sinningia polyantha, which is described on its own page,. I set seed on a couple of these plants, and they came true from seed (the resulting plants had the same properties as the parents). The other had flowers which bore similar "douglasii-type" streaks, but otherwise was quite different. The seedlings of this second type were, however, quite similar to one another, suggesting that if the seeds were of hybrid origin, they were likely to be an F1, that is, a cross between two species, which would account for the relative lack of variation within this second type. I set seed on the second type, and have seedlings coming along, but they have not bloomed yet, so I do not know whether the second type comes true from seed. Because of the differences, I gave the second group of plants the name "Desafinado", from the Portuguese word meaning "out of tune". It is also the title of the first bossa nova hit from back in the 60s, and a much finer tune than the ubiquitous "Girl from Ipanema", and also written by the Brazilian composer Antonio Carlos Jobim. a hybrid resulting from hummingbird activity in Mauro's greenhouse. This picture shows the terminal peduncle of Sinningia "Desafinado", which is quite different from the platform inflorescence of S. polyantha. For a table showing some of the differences between "Desafinado" and the "real" S. polyantha (sp. "Waechter"), see the table on the comparison page, which also has some pictures illustrating these differences. Our local hummingbird, Calypte anna, often visits S. "Desafinado" when it blooms here in May. In my yard, S. "Desafinado" finishes blooming just about the time that the first S. polyantha flowers open. Here is a picture of the whole plant, with semi-glossy green leaves in pairs. Sinningia sp. "Waechter" has tough hairy leaves in whorls of three. 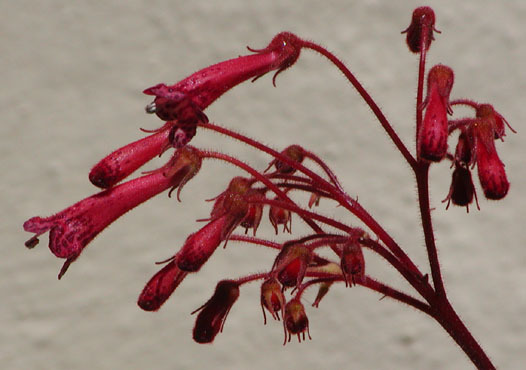 Also evident is the redness of all the stems, flowerstalks, and petioles, in great contrast to those of S. sp. "Waechter", which are mostly green or ruddy brown. One of the most striking features of S. "Desafinado" is the sharp line at the junction between the shoot and the tuber. This junction is actually a couple millimeters up the shoot. In the fall, when the plant is going dormant, this junction turns into the abscission layer: the stem above the junction falls off, while the stub remains. A couple of moon-crater-like stubs can be seen in this picture, one just below the two shoots and the other just to the right of them (and another older one, in gray, between the other two stubs). In the picture, the junction is not an abscission layer yet, since the photograph was taken in early spring [April 2009], before the plant had even bloomed. Several more dormant buds, colored bright red, can be seen. These buds, scattered over the tuber but clustered around the stubs of previous years' shoots, are an attractive feature in themselves. 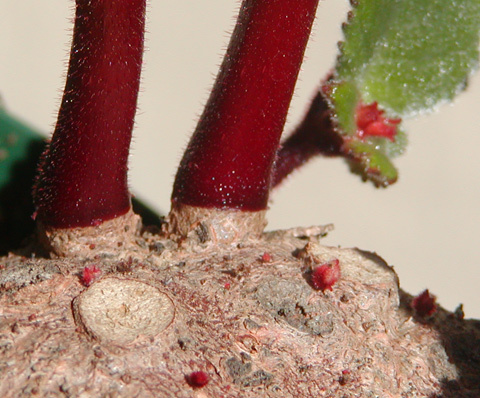 Presumably, they are located in the "axils" of the stem that the tuber represents. Also see a picture of the tuber. Another page has a picture showing a sprouting tuber. Feature table for Sinningia "Desafinado"
Hardiness This seems to be one of the hardiest sinningias. In my back yard, it has survived 26F (-3 C) without harm to the new shoots which had already formed. Recommended? Highly. Easy to grow, nice foliage, bright flowers, what's not to like? Taxonomic group Probably, the douglasii group of the Dircaea clade. 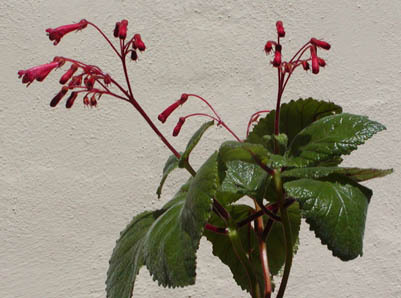 Note that the handsome plant shown under the name S. sp. 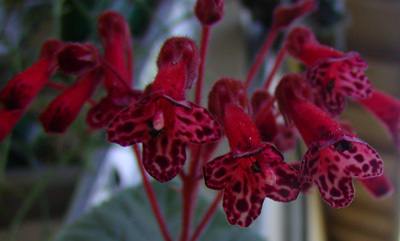 "Waechter" and accession number USBRG 98-093 on Ron Myhr's Gesneriad Reference Web is one of the "Desafinado" types, flowering from a terminal peduncle rather than the platform inflorescence of the "true" S. sp. "Waechter".